Christianity’s most shocking claim isn’t that God exists; it’s that He communicates. The Bible begins with the story of creation, where God created “the heavens and the earth” with a Word from His mouth (cf. Ps 33:6). In theology, we know this as revelation—the means by which God “reveals” His nature and purpose. And while “the heavens declare the glory of God” (Ps 19:1), it is in Scripture that God’s Word is most specifically articulated. So when we come to Psalm 119, we find the unnamed psalmist singing a song of praise about the very nature of this inspired Word. As we observed yesterday, the psalm is an “acrostic” poem of 22 sections of 8 lines each—each of the 22 sections corresponding to a sequential letter of the Hebrew alphabet. In his study of this psalm, David Noel Freedman calls it“endlessly inventive,” though says there is “no more order than in a kaleidoscope.” (Freedman, Psalm 119, p. 87). And this is true. But our aim this week is to surface some of the features of this poem so that we can gain a better understanding of God’s Word. Today we start by examining the terms that the psalmist uses to describe the Bible itself. “Law” (Hebrew: tora): This is probably the most familiar term—used about 25 times (vv. 1, 18, 29, 34, 44, 51, 53, 55, 61, 70, 72, 77, 85, 92, 97, 109, 113, 126, 136, 142, 150, 153, 163, 165, 174). The connection to “teach” (119:33) emphasizes the connection to God. The Law is meant for obeying God—not merely intellectual satisfaction. The Law may be used to refer to God’s specific statutes, to the Pentateuch, or to Scripture as a whole (in John 10:34, Jesus uses Law in to refer to the entire OT). 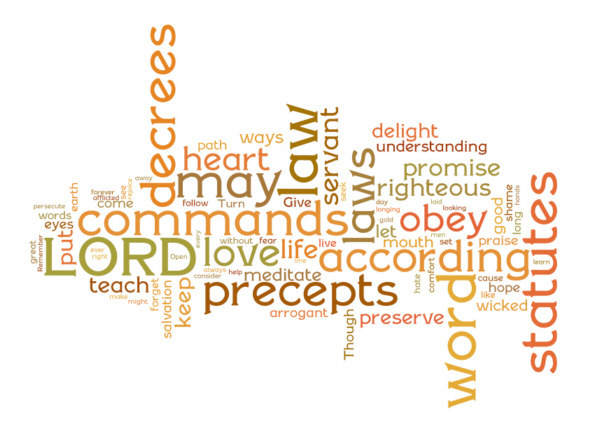 “Word,” sometimes “Promise” (dabar, also imra): This is the preferred term to refer to the commandments of God. The word “Word” appears roughly 39 times (vv. 4, 5, 8, 17, 34, 44, 56, 57, 60, 67, 88, 100, 101, 129, 134, 136, 145, 158, 167, 168). The term is general, but it elicits a variety of responses. “Testimonies” (‘edot): This term occurs 23 times, always plural with the exception of v. 88 (vv. 2, 14, 22, 24, 31, 36, 46, 59, 79, 88, 95, 99,111, 119, 125, 129, 138, 144, 146, 152, 157, 167, 168). This was a legal term that had both positive and negative connotations. Negatively, Israel was commanded to place the book of the law next to the Ark of the Covenant, ‘that it may be there as a witness against you’ (Dt 31:26). Positively, the idea of “testimony” suggests the reliability of God’s Word. “Precepts” (piqqudim): This term appears 21 times (vv. 4, 15, 27, 40, 45, 56, 63, 69, 78, 87, 93, 94, 100, 104, 110, 128, 134, 141, 159, 168, 173)—always in the plural. This is a word used to refer to some type of officer or overseer. Jeremiah 23:2 describes that God will “attend to [poqed]” the wayward shepherds. This means that God’s Word impacts every detail of our lives. “Statutes” (huqqim): This term appears 21 times (vv. 5, 8, 12, 23, 26, 33, 48, 54, 64, 68, 71, 80, 83, 112, 117, 118, 124, 135, 145, 155, 171). This term speaks of the binding force of scripture and its durative character—Isaiah 30:8 speaks of God’s Word enduring forever. “Commandments” (miswot): Occurs 22 times (vv. 6, 10, 19, 21, 32, 35, 47, 48, 60, 66, 73, 86, 96, 98, 115, 127, 131, 143, 151, 166, 172, 176). This term simply refers to the Bible’s ability to give direct orders. “Judgments” or “Ordinances” (mispatim): Occurs 23 times in the plural (vv. 7, 13, 20, 30, 39, 43, 52, 62, 75, 91, 102, 106, 108, 120, 137, 156, 160, 164, 175) and four times in the singular (84, 121, 132, 149)—though in verse 84 the term is not used of the Word of God. These are most often used in a civil/legal sense—that of a wise judge presiding over His people (cf. Ex 21:1; Dt 17:8-9). Scripture offers a glimpse of the fair dealings between God and man. “Way” (derek): Used 13 times (vv. 1, 3, 5, 14, 26, 27, 29, 30, 32, 33, 37, 59, 168). This term describes a pattern of life that God lays out. In the New Testament, John begins his biography of Jesus by cribbing the opening lines of Genesis: “In the beginning was the Word, and the Word was with God and the Word was God” (John 1:1). What is John saying? John is saying that Jesus is the exact revelation of God. This is why the unnamed writer of Hebrews would later say that “Long ago…God spoke to our fathers by the prophets, but in these last days he has spoken to us by his Son” (Hebrews 1:1-2). What the Bible reveals in text, Jesus reveals in flesh and blood and sinew. In his excellent book A Clear and Present Word, Mark A. Thompson adopts a scholarly approach to the subject of language and communication. God’s Word, he says, can never be separated from God’s redemptive work in history. But this also means something significant: if Jesus is the embodiment of this Word, then it changes the way the Bible is seen culturally. How? In today’s post-everything world, our greatest prophets insist that there are no absolutes, only perceptions. Language, whether in a sacred book or otherwise, is always colored by the agenda of its culture of origin. We can only read the Bible as reflective of a primitive, pre-scientific era. It’s poetry may be moving, it’s stories beautiful, but we can’t possibly apply it to everyday life. But if Jesus is the exact embodiment of the Bible, then this changes everything. I can “deconstruct” a text; I can’t deconstruct a person. So even if I remain skeptical regarding God’s Word embedded in Scripture, I remain confronted by God’s Word embodied in Jesus. For Christ’s followers, this provides added reason for celebration and worship, because the Bible bursts free from being merely a collection of precepts, but a love song that’s been playing before the needle ever dropped. In tomorrow’s post, we’ll examine more thoroughly the ways the Bible has an impact on the lives of those who trust in its Author. This entry was posted in Psalms: God's Play List and tagged Psalm 119 by Christopher J Wiles. Bookmark the permalink.